Antimicrobial stewardship is a set of coordinated approaches to improve the use of antimicrobials, such as antibiotics, within a healthcare facility. Antimicrobial stewardship is not only important in preventing the spread of antimicrobial resistance, but also improves patient outcomes and reduces costs for healthcare facilities. 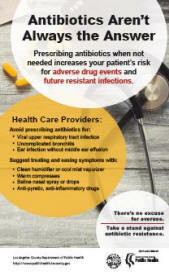 Everyone in a healthcare facility has a role in making sure antimicrobials are used appropriately. 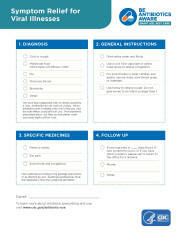 Check out the additional resources below to learn more about how you and your facility can develop and/or improve your antimicrobial stewardship program. 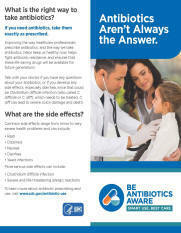 This poster reminds clinicians to perform a review of antibiotics 48 hours after antibiotics are initiated, and to ask themselves some key questions. At this time, staff should reassess the continuing need and choice of antibiotics, using clinical and laboratory data (including culture results and local antibiograms) as they become available. 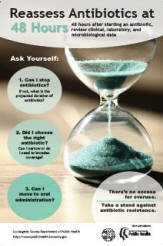 This poster serves as a reminder for clinicians to accurately interpret culture results. Clinical criteria and additional laboratory data can help distinguish infection from colonization. 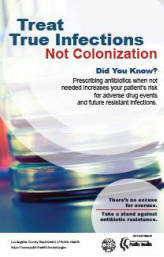 Poster (Double-sided English/Spanish 15”x24”) This poster aims to help healthcare providers remember when antibiotics aren’t necessary, and to provide them with a reference to help explain to patients why they do not need an antibiotic prescription.